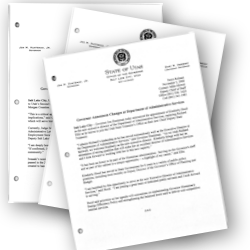 This series contains press releases and media advisories given to media sources to publicize the governor's activities and opinions. The records contain information on the appointment of judges and state officials, announcements of new businesses in Utah, legislative announcements and official decrees recognizing and celebrating significant individuals and events. Page Last Updated September 13, 2012.